Who open the cage and let this cat out! 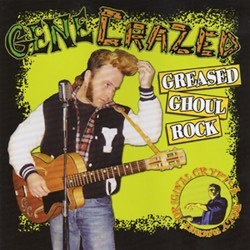 During the past few years, Gene Crazed was one of the most deranged primitive rockabilly singers from the underground scene. Finally his first album is released (or maybe we should say, "escaped"). In 20 years he wrote and recorded more than 260 songs, played live a lot, all over the world. He appeared on vinyl, CDs, videos and compilations. But he released just one 45-rpm ... an EP, "Rockabilly Spooky". If you're looking for wild raw talent ... Gene Crazed fits the mold perfectly.